SUPER sub Harry Forrester was the hero for Rangers as his stunning 87th minute strike secured three points on a day of drama in the Championship. With second place Hibernian going down 3-2 away to Dumbarton, it looked like the Light Blues would only move nine points clear at the top of the table, but Forrester had other ideas! Michael O’Halloran did brilliantly to tee up the former Aston Villa playmaker and his delightful curled effort flew across Saints keeper Jamie Langfield and into the opposite top corner to send a packed Ibrox into ecstasy. What a moment it was for Forrester as he enjoyed his first Gers goal by sliding to his knees in front of the Copland Stand, and the result means his side are now 11 points ahead with just 10 games remaining. On a clear, crisp afternoon Mark Warburton’s men showed their intentions early on with Langfield diving to grasp a low cross from Jason Holt. Young centre half Jack Baird was then called into action when he barged the marauding Lee Wallace to the ground in the box, but ref John McKendrick rightly decided it was a fair challenge. 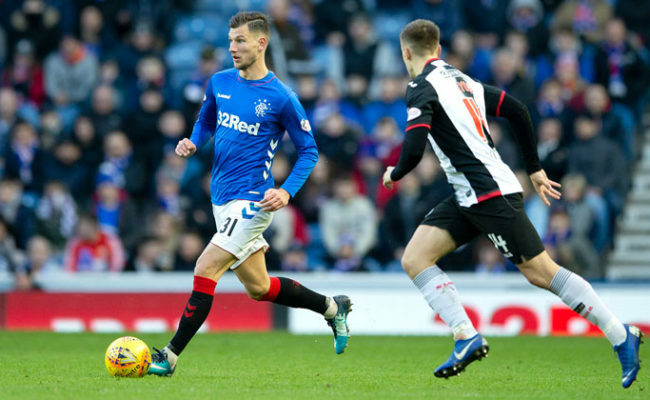 It was a positive start from the league leaders and with eight minutes played Kenny Miller came so close to opening the scoring when he curled a shot inches wide from 18 yards after Michael O’Halloran had darted inside with pace from his right-wing berth. The former St Johnstone forward was clearly fired up on his home debut and, given time, his direct runs will surely help add another dimension to Rangers’ attacking play. On the other flank Barrie McKay was also seeing a lot of the ball in acres of space although right back Keith Watson and former Murray Park kid Calum Gallagher were always keeping an eye on the Gers star and the overlapping Lee Wallace. 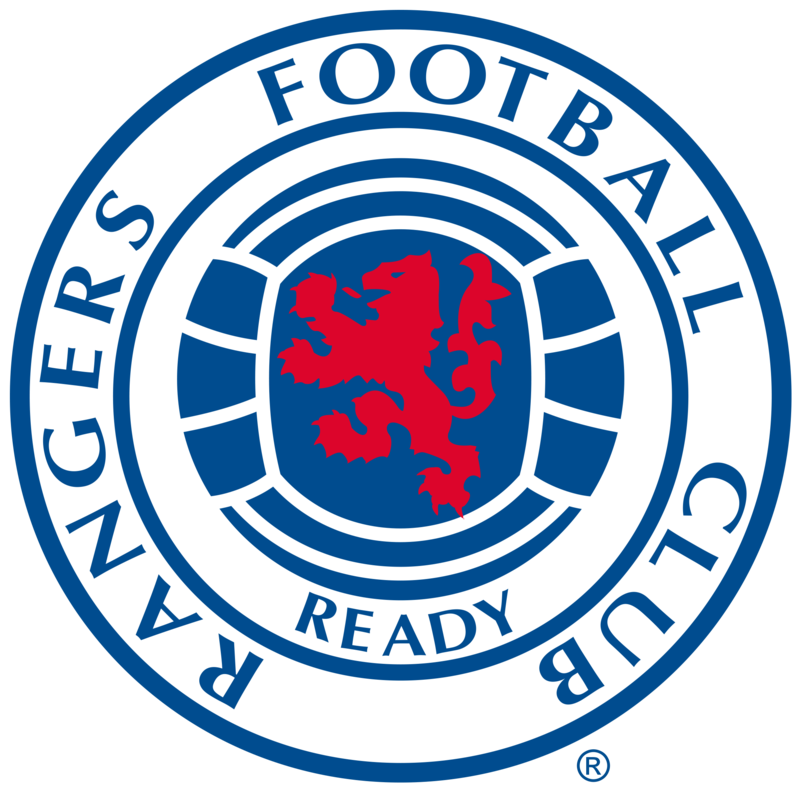 With the Union Bears in full voice and doing the bouncy to keep warm Rangers attempted to shift through the gears before the half hour mark but found it tough to do so against an organised and stuffy Saints side who had won three of their four previous league games. Warburton’s men were looking for a moment of magic to unlock the visitor’s rigid backline and on 31 minutes Wallace played a neat one-two with Miller to get in the box but his volley flew over the bar and had to be dodged by the wrapped-up supporters in the Broomloan Front. 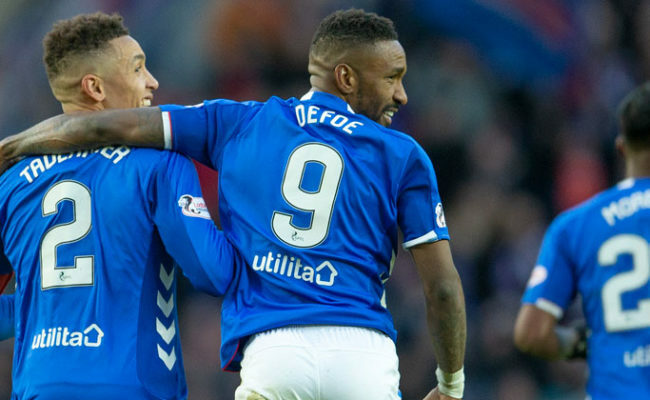 A foul on Holt by Stephen Mallan gave Rangers their next opportunity to test Langfield but Tavernier slipped as he connected with his free-kick from 25 yards, sending the ball once again high and wide. Miller had 13 goals before this game and he should have had his 14th with eight minutes of the half remaining. O’Halloran did brilliantly to pick out the former Scotland striker with an accurate cross but he proceeded to dink the ball over the bar from three yards when it looked easier to score. As ever Miller was putting in a great shift for his side though and after sprinting along the Saints’ 18-yard line while skipping past three defenders, he then teed up O’Halloran who sent across a right foot shot back across the face of goal and wide of target. At the half-time whistle there were a few grumbles from the four stands with Rangers failing to get their noses in front, but the news coming through that second placed Hibs were losing 2-0 at Dumbarton certainly helped to lift spirits within the stadium! Whether this info had filtered down to the home dressing room at the interval or not, Warburton’s side now had a massive incentive to win this afternoon and thankfully they did just that! Within the first five minutes of the second period the home support were out their seats when Miller was blocked by Andy Webster as he nutmegged the visitor’s captain to get into a shooting position. The ref immediately decided to let play continue which left Miller hitting the turf in frustration. O’Halloran then brought out the first saves from Langfield after the restart. 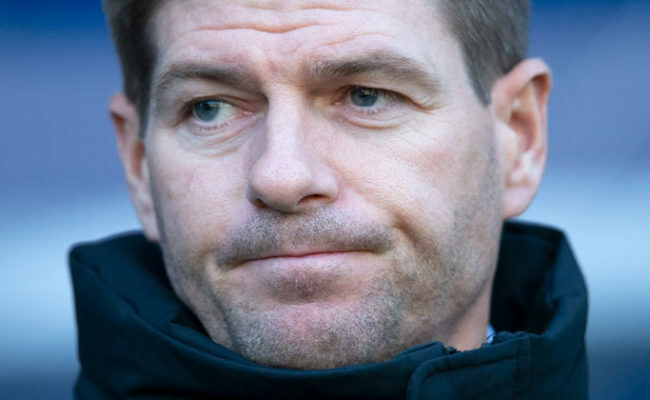 The first went straight into the arms of the 36-year-old keeper and the second was blocked by his legs as Rangers began to pile on the pressure at the Copland end of the ground. 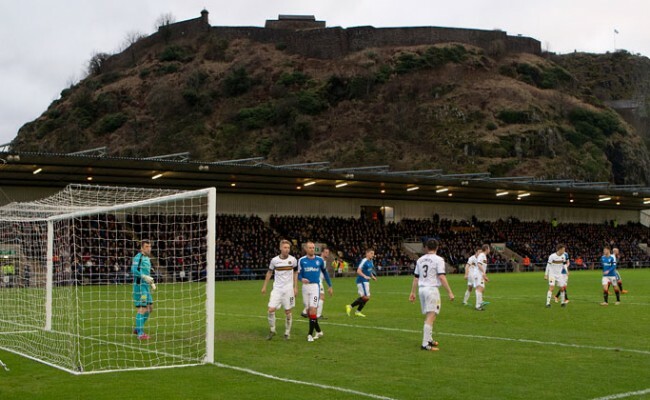 With an hour played Billy King and Dean Shiels were introduced to the game for Barrie McKay and Nicky Law as the Light Blues looked to turn their almost constant possession into a goal. Langfield, to his credit, was in inspired form between the posts, and after Shiels had been brought down he pulled off a terrific save to deny Tavernier who curled a free-kick over the ball and towards the top corner. While Rangers pushed forward the visitors had to be watched on the counter with Steven Thomson and Jordan Stewart providing fresh legs from the bench in the second period. 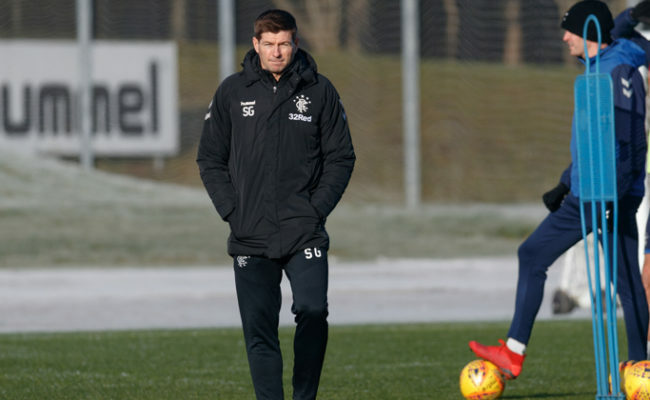 Rangers, however, were creating by far the better opportunities but when the unmarked Miller blazed a volley over from 15 yards and King hit the side netting from close range, there was that sinking feeling that it was going to be one of those days. As the clock ticked down there was to be late drama as both teams attempted to claim the crucial three points on offer. St Mirren sub Stewart had a shot from 10 yards blocked by Tavernier before Langfield denied King, again with his legs, following a swift attack. With nine minutes left, O’Halloran then trundled a cross into the six yard box but King couldn’t get enough purchase on his effort and the ball was deflected out for a corner. On 87 minutes the moment the loyal Ibrox faithful had been waiting for arrived when Forrester finally found the net. It was a wonderful finish from the midfielder and it was no more that Rangers deserved as they dominated this contest from start to finish.